The panda bear is from China and obviously not for eating. 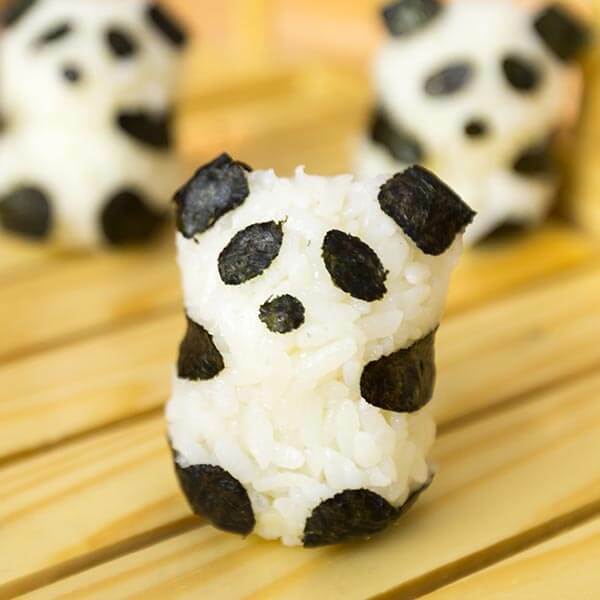 This sushi panda bear on the other hand is created especially to eat. A great add-on that’ll put a smile on the faces of your sushi dinner party guests. It goes without saying that children will also enjoy these cute looking sushi bears. The first step of this recipe is rather unusual. Before you start cooking, you need to purchase a so called Rice Ball Mold Mould with Nori Punch Sushi Panda Shape. (Hey, Chef Devaux didn’t come up with the name.) This kit consists of a mold to shape rice and a nori cutter that works like a paper punch. Those two items will enable you to create the required Panda Bear shape. It’s worth the investment, a mere few dollars that’ll buy you lots of sushi fun. The kit comes with a silicon mat. Put the mat on a cutting board. Place a sheet of nori on the mat. Put the cutting tool on the nori and gently press it down. You’ll hear cracking noises, that’s the cutting tool cutting through the nori. Keep pressing until you don’t hear any more cracking noises. Gently remove the pieces you just cut loose. Be careful to leave them intact! You need them to give your panda bears a face. Take the rice mold and fill it with freshly cooked and seasoned sushi rice. Press it with the little lid. Then take the lid off and gently remove the molded rice. Put the rice bear on the table with the face down. Wet your hands a little, that will prevent the rice sticking to your fingers. Take the long piece of nori from the cut-outs, place in on the middle of the bear and curve it around the shape. Turn the bear on its back and stick the eye pieces on the place where you think the eyes should be. Add the mouth and feet. You know where, right? If you don’t, watch the video to find out. Put the bear on its feet and fold the ear parts around the ears. Stick the tail part on the lower part of the back and there you go: a sushi panda bear. Playing with your food was never so nice! October 21, 2014 Sushi Art, Tuna "Maguro"